Rail and stile door construction includes coping cuts on both ends of the rails. This cut requires the work piece to be fed through a shaper at a perfect 90 degree angle. Without the support of a coping sled or cross-sliding table this cut is impossible. The Infinity Tools COP-100 Coping Sled (Manufacturer Website) is one of the highest quality solution on the market for making coping cuts short of a sliding table. The Infinity Tools COP-100 professional coping sled gets the essentials right, but it is not problem free. Infinity Tools created an excellent video that introduces us to the features of the COP-100. I think the company short changes its own product a bit. The build quality of the COP-100 should be front and center. Nevertheless, the video highlights what makes the sled work so well. Construction of the sled is top quality. Metal and hard plastic everywhere. This tool will take abuse. The parts that guarantee the sled's proper performance are strong. It is almost impossible for the COP-100 to go out of alignment during daily use. Infinity Tools show very good engineering overall. The sled is dominated by three large hold down clamps. 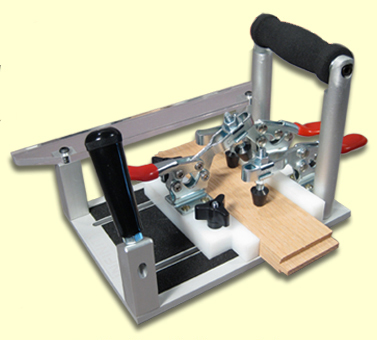 The clamping force of even one of these clamps is enough to secure the piece from being lifted by the cutter. Rotation around the clamping point is still possible until a second clamp is engaged. At this point the work piece will not move; period. As far as coping sleds go, you will be hard pressed to find a better one. The issue with this system is the need to engage and disengage 2-3 clamps for every cut. In practice this means that the operator will spend more time securing the work piece in the sled than actually performing the cut. For the shop that occasionally makes doors, this might not matter. In even light volume production the clamp/unclamp time will quickly add up. As shipped there is no tear out guard on the Infinity Tools Cop-100. The company recommends replacing the rear guide block with a longer one. This block makes contact with cutter and provides the tear out protection. After the first pass the block will bear the profile of cutter. This is less than ideal, since the cutter is held in place with screws. Changes from one cutter to another on the shaper requires the guide block on the sled to be replaced. If you only run a single profile this won't mater much to you. Alternatively a sacrificial strip of wood can be added in the channel that holds the work piece. One of the three clamps can be recruited to hold it in place. This setup is perfectly serviceable, but it adds yet more time to the work piece clamp/unclamp process. The depth to which the work piece must be inserted into the Infinity Tools COP-100 for an accurate cut is determined by the shaper's fence. The sled must be held tight against the fence while the work piece is inserted into the sled. When the piece hits the fence it is in the correct position and can be clamped into place. Again this operation is repeatable and accurate, but somewhat slow. The best feature of this sled is the ability to have two hands on the sled when making the cut. The work piece is secured in place freeing both hands. This makes it easy to guide the sled through the cut. An optional guide rail for shaper tables with T-slots practically turns the sled into a small sliding table. The Infinity Tools COP-100 makes continuous contact with the fence of your router using a lexan strip mounted just over 3" high. Your shaper's fence needs to be at least that tall for the sled to work. While this can be limiting factor on some router tables, it turns into a great asset where the fence is tall enough. The bit won't hit the sled like it can on other sleds. To some this review may seem a bit unfair. The Infinity Tools Cop-100 is a coping sled at the high end of what coping sleds can be. It takes more time to use than a sliding table. That's not necessarily a bad thing. The COP-100 is significantly cheaper than a shaper with a sliding table. It is, however, not performing at the level of a stationary machine; it is performing at the level of a coping sled. If judged on its own merit, the sled does what it needs to do. Accurate cuts that are repeatable and of consistent quality. If you don't mind the extra time it takes to operate the sled, the Infinity Tools COP-100 is an excellent tool. As far as coping sleds go, you will be hard pressed to find a better one. The sled is available directly from Infinity Tools.